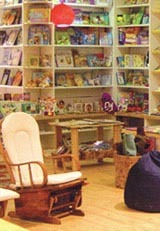 HAKAWATI is the first children’s bookstore of its kind in Jordan It is home to a comprehensive collection of children’s books in Arabic, English and French and will be the proud host of distinguished local authors artists and storytellers. Ongoing activities at HAKAWATI will promote cultural diversity by integrating different languages (starting with Arabic, English and French), by hosting various arts and crafts projects, and by exploring myriad international traditions . HAKAWATI is ’edutainment’ at its best: It provides an artistic and fun atmosphere for children to learn as they play, to discover and develop their abilities, and to grow to appreciate both their local and global communities. HAKAWATI is no regular bookstore: it is a creative and collaborative environment that embraces our youth and their talents, encourages them to read and express themselves freely, and instills in them a respect for the community and world culture.